A lot of walkers have re-died at the hands of the lead characters in AMC's The Walking Dead. 349, in fact, according to the infographic The National Post released, which not only organizes each walker with their killer in order, but also indicates the weapon used and then tallies up the totals by character and weapon. Via ScreenRant, The Post credits staffers Andrew Barr and Richard Johnson for coming up with the stats for the infographic, part of which you can see below. CLICK the above image to view the full infographic! 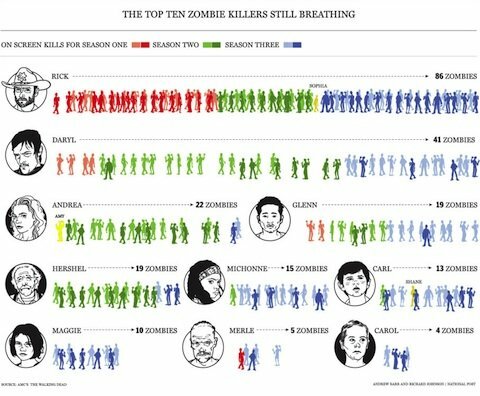 As you can see, Rick Grimes has the most on-screen kills, which is to be expected, given that he probably spends the most time on screen. Meanwhile, Daryl cuts Rick's number in half, locking in 41 zombie kills over the course of the first two and a half seasons. Andrea brings in a couple walkers more than half of that, at 22, and Glenn and Hershel are right behind with 19. The full infographic lays out each and every on-screen walker kill, beginning with the little girl Rick killed at the start of the pilot, and leaving off with the little girl Michonne sword-stabbed in the Season 3 fall finale. Kind of funny (in a totally morbid way) that the killed walkers are book-ended by little girl zombies. Despite the noise they make, handguns seem to be the most popular weapon, having been used for about 1/3 of the walker deaths. Plus one, if you count the pistol whip.The golfball is one of the single-use weapons among the list. I'm sure a lot of work went into this, but at the same time, I like to think it was fun for these guys to make this list.